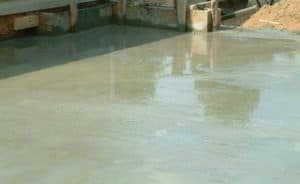 Bleeding In Concrete - How To Reduce Bleeding In Concrete? Bleeding can be defined as the tendency of water to rise to the surface of freshly placed concrete. It is another form of segregation where some amount of water comes to the concrete surface after placing and compacting, before setting. The water content carries some particles of sand and cementing materials. Sometimes bleeding helps to reduce the plastic shrinkage cracks in concrete. 1. Concrete loses its homogeneity which results in weak and porous concrete. 2. It makes the concrete permeable. 3. It delays the surface finishing in pavement construction. 4. Bleeding of concrete causes high water-cement ratio at the top surface. 5. The bond between two concrete layers become weaker. 6. Pumping ability of concrete is significantly reduced. 1. Design the concrete mix properly. 2. Add minimum water content in the concrete mix. 3. Add more cement in the mix. 4. Increase the amount of fine particles in the sand. 5. Use a little amount of air entraining admixture. 6. Use more finely ground cement. Is it good if I would try for IAS exam ? I just completed my graduation in civil and can I continue my preparation for exam with job ? Thanks a lot for the posts. They’re really educating and enjoyable.